Four cones used to mark the corners of a fairly large square or rectangle. As in a relay the first player in each team starts holding the blackboard/chalk eraser/baton. 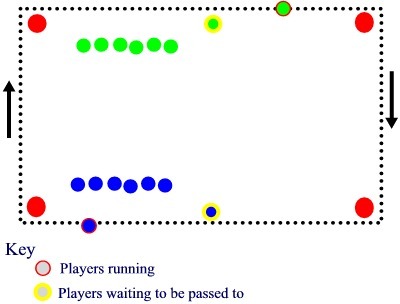 Both players then run around the outside of the cones following the course handing over the baton when they have completed a circuit and get to the next player waiting in their team . Play continues until one team has done the circuit twice.